Parents’ attributions about their child’s personality and behaviour are known to predict the quality of parent-child interactions and outcomes for the child, including those from parenting interventions. Nothing is known, however, about the quantity and quality of attributions parents use during free speech about their children referred for treatment of behavioural and emotional problems. We tested hypotheses about the types of attributions and associations among parental attributions, parental psychopathology and child conduct problems, using 504 five-minute speech samples (FMSS) coded using the Parent Attribution Speech Sample (PASS) coding system. Both mothers and fathers talked about their thoughts and feelings regarding their children with disruptive behaviour problems (N = 295; 74% male; 3–8 years old). The assessment of spontaneous parental attributions via the PASS coding system was shown to be valid and reliable. Mothers made more negative, dispositional attributions than fathers, however, parents of either gender made, on average, more positive than negative attributions about their children. Parents’ natural attributions about these children with emotional and behavioural problems were rather independent from parents’ own mental health, but were consistently related to child factors. 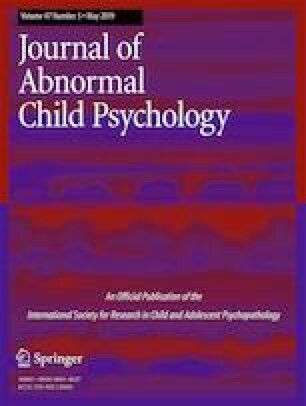 Specifically, across parent gender and across all attribution dimensions, levels of callous-unemotional traits were associated with spontaneous parental attributions above and beyond other child and parent factors. Overall, the results show that parents’ spontaneous speech about referred children contains important information about their causal attributions, and that these are associated with child temperament rather than specific referral symptoms. NHMRC Project grants 455439, 455372, 568667, and 1041793. Informed consent was obtained from all individual participants included in the study. Details on page 6 under Procedures. Sawrikar, V., Mendoza Diaz, A., Hawes, D., Moul, C., & Dadds, M. (2018a). Why is this happening? A brief measure of parental attributions assessing parents’ intentionality, permanence, and dispositional attributions of their child with conduct problems. Child Psychiatry and Human Development. https://doi.org/10.1007/s10578-018-0844-2.